Grease fires happen when collections of oil or grease on a stove, oven or fryer get hot enough to ignite. It's easy to lose track of a pot of oil on the stove until it ignites. Different oils burn at different temperatures (called the flash point), but every oil you can buy at the grocery store is capable of catching on fire. Grease fires are extremely dangerous because the fuel source (the grease) is a liquid, and easily splashed if you try to spray water on it. Grease fires burn very hot and can quickly spread to cabinets or other flammable areas of the kitchen. The most important thing you can do to prevent a fire in the kitchen is to stay put. 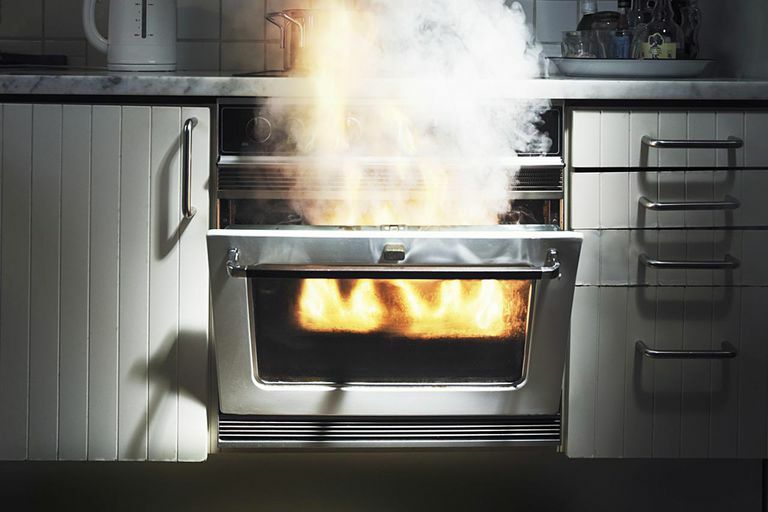 The NFPA reports that unattended cooking is the leading cause of home cooking fires. Stay by the stove and be prepared for flames. Do not use water on a grease fire. (see Tips) Start evacuating everyone from the building. Fires spread extremely fast and can overwhelm victims in minutes. Treat burns only after evacuating the building. Do not put water on a grease fire. This can not be stressed enough. Pouring water on burning grease or oil will not extinguish the fire. It will only cause the burning oil to splash, spreading the grease fire around. Do not try to carry the fire outside. Trying to carry a pot or pan full of burning oil will just slosh and splash the grease fire.